Two weeks removed from a France trip and still no dedicated blog post! That’s bad! It’s a long one – but hopefully a good summary of a great experience! I spent eight days in France in early June helping lead an alumni travel trip for the College where I work. 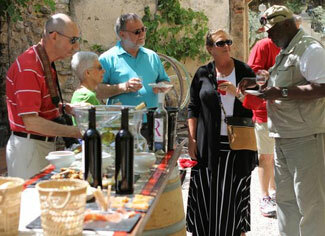 The group of 13 spent four days in the Languedoc, headquartered in Montpellier, and had a really great wine experience. The idea was to expose regular wine drinkers to a variety of wineries and a personalized touch that would help them understand Southern France winemaking. Domaine Virgile Joly – Virgile was one of the big, big hits of the trip. We traveled on a rainy Sunday to Saint Saturnin de Lucian and met Virgile in the center of town. 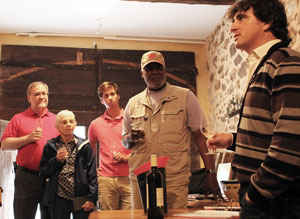 He led us to his small cave-like tasting room where he educated, entertained, and charmed the group. As he warmed up his smile, the French accent, and the detailed knowledge of winemaking, the stop was the perfect start to our journey. 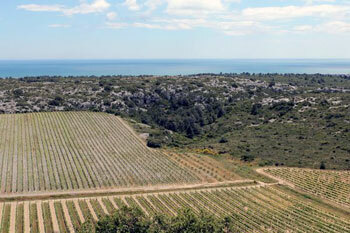 Virgile’s Joly Blanc is still one of the great white wines of Southern France. The wine is mostly Grenache Blanc. It has been honored in numerous competitions and is delightfully refreshing. 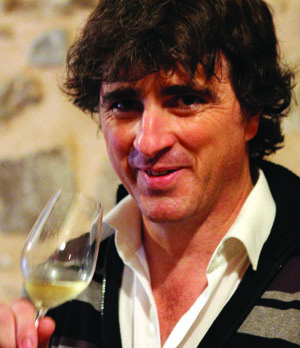 I first met Joly at the 2012 Millesime Bio in Montpellier. He was clearly a rock star then for France’s organic wine movement and his reputation only grows. His production is still relatively small but he is not shy in sharing his dream is to build his own winery. Virgile really captivated the group. Two of the highlights of his wine, beyond the entry level red and white which make it to the U.S., was his top red Saturne (in photo at top) and his great little dessert Rose’. After four days in the Languedoc we traveled hi-speed rail to Paris and spent five days there. Our lunch in tiny Saint Saturnin de Lucian at La Pressoir was one of the best meals of the trip. We had a delightfully fresh salad with salmon and duck, beef grilled before us over an open fire, and one of the best chocolate grenache-filled chocolate soufflés one can imagine. But the lingering memory of our first stop was Virgile’s incredible enthusiasm and charm. Our group held up Virgile as the gold standard for wine stops for the rest of the trip. Chateau le Bouis – After a quick morning stop in Narbonne to visit its famous market, we drove toward the Mediterreanean coast. This stop was set up for its views of the sea and a very light lunch. Our hostess was charming, the crusty French bread was the best of the trip, food was great, and the wines were surprisingly consistent and lovely. The white and Rose’ were particularly good wines. The large patio and vine covered patio where we tasted is well suited for visitors. It’s picturesque, charming, great food and wine, with delightful views. Gerard Bertrand’s Chateau La Hospitalet – This stop was one of the most anticipated for me having tasted many of Bertrand’s wines and their wide availability in the states. 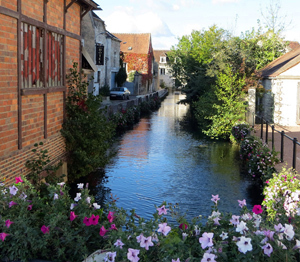 It didn’t disappoint but was unlike most stops in the French countryside. That’s best explained by noting it was more like a stop in Napa or Sonoma. To Bertrand’s credit they have the wine tourism thing all figured out. The tasting room looked like any major tasting area at a successful or prominent Napa winery. The wines were consistently good and you won’t have much trouble finding them. The highlight was a walk in the vineyard before tasting. A charming young Brit led us up a small hill to the very windy crest where we had a stunning view of the Medeterreian. (in photo above). Between the base of that hill and the sea were three small plots of vineyard. The top wine from the Hospitalet location comes from that spot. It was big rich and age-worthy wine. I bought a bottle of the L’Hospitalitas for 41E or about $55 to bring home and age. (that’s the wine in the top photo, center). Gerard has seven locations in Southern France and its definitely worth the stop to taste wines you CAN get back home and as a contrast to the many smaller wineries. This stop couldn’t be more different than all the others. 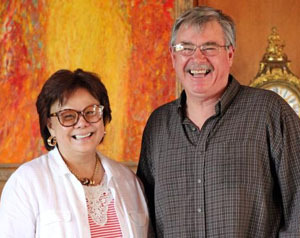 Bertrand produces more than 6 million cases of wine at his combined seven locations. “Ozzy” was a very amiable host! Chateau Le Carcarasse – This stop was a bit of a comedy of errors. Our bus driver was given an early itinerary that included this stop. But he was later given updates that noted we were going elsewhere. Since none of us were familiar with Southern France – we ended up here. I scrambled, as group leader, and explained the embarrassing predicament and the staff scrambled. They put together a delightful tasting and bites of food in about 15 minutes. Our group was a tad confused, our liaison who made arrangements for our other stop was confounded, our bus driver distressed – but it all worked out. The food was incredible and the wines were darn good. The Chateau is stunning. They do seem to be much more in the condo business than wine business, producing just 1,000 cases, but the wines were solid. Joe O’Connell talking about his Merlot vineyard. O’Vineyards – This place is such a great story of a family packing up and moving from Louisana to Southern France. Their college-age son will someday be viewed as a pioneer in social media in the Southern France wine business. I met Ryan at the 2012 wine fair and kept in touch. Liz O’Connell is known as quite a cook – a reputation she backed up during our visit. Joe O’Connell the former homebuilder and winemaker walked out group through all the steps of winemaking. That was an experience the group had not had yet since we were fighting downpours during the Joly visit. The travel group loved it. They got to taste wines from the stainless steel vats and barrel taste Cabernet which was in its 18 month in the oak. Liz and Joe O’Connell are great hosts! Joe’s wines were some of the best we tasted during the trip. We left with quite a few bottles. I carried home a 2010 Merlot which I thought was one of the best 100 percent Merlots I’ve ever tasted. It’s going to get a little more time in the bottle before I pop it open. The O’Connells have worked the tourism angle like few others in southern France. If you Google winery visit in Southern France, chances are O’Vineyards will come up even before something like powerhouse Bertrand. O’Vineyard wines will have a bottling available from California-based Naked Wines very soon. They are located in a small village near the touristy, walled city of Carcassonne. Summary – Languedoc wines continue to impress. Much has been written how this area was marred as plonk and boxed wine for years. The reputation was true. But in the last 15 years or so producers have realized their wines can be placed beside many of the great bottles of France. Talking wine with one of our group members at Chateau le Bouis. I love the earthy and rich quality of the reds and freshness of the area’s whites. They make Rose’ which challenges – almost – Provence. But the people are so welcoming and genuine. It remains true that you are likely to interact with the winemaker or winemaker/owner if you pre-arrange a trip to the Languedoc. We had a great trip. If you like Cotes du Rhone wines, Languedoc is a logical progression. Carignan is a funky grape which will be new to many wine drinkers, but it’s prominent in the Languedoc. I’ve grown to love it. It gives the wines a real earthiness many of the Rhone wines lack.